Portable dispensing ability at a great price! Now you can easily serve your special homebrew when you’re away from home. 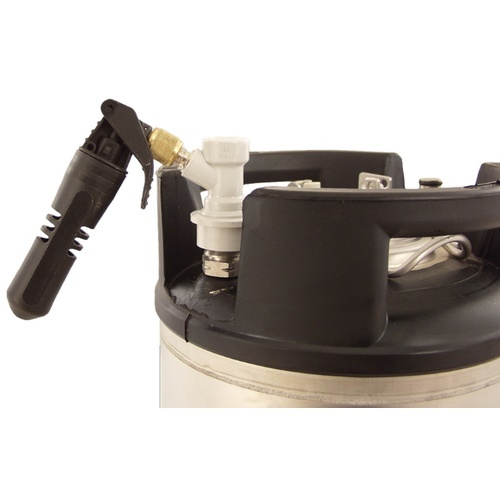 This unit works with ball lock kegs. Requires 2-5, 16g cartridges to push 5 gallons of beer. Will not work for carbonating your beer because of the small amount of CO2 in each cartridge. This seems way more convenient than having to have the CO2 tank for dispensing. The piece that screws on to the ball valve disconnect will not remain attached to the trigger mechanism. Anytime there is any pressure it leaks. I was able to use this once, and I really mean once. I put CO2 into my keg at a party one time. The second time I went to do it, the plastic trigger piece broke. Under the cap is a red button which the trigger pushes down to inject the CO2, so I tried to just push that down to get it to work. The O-ring under it came out and emptied my CO2 cartridge. Don't bother with this item, its not the same one in the picture, possibly they substituted the product and are selling a cheaper one? Have been using the CO2 ball lock injector for parties for a couple years now, they work great, just a quick squirt and the beer flows like its supposed to! Does what it should, but it would be nice if it was made out of stronger materials. I picked one up to take kegs to parties. It worked great. I have used it at a few parties and some camping trips, I would definitely recommend. The thing's made of plastic. It lasted maybe six months. I carry a CO2 bottle instead. Bought this to take to a friends wedding rehearsal party to serve the beer I brewed for them. A huge success. I loved being able to serve from the keg to prevent having to transfer the beer twice. Just like at home. Two cartridges pushed the whole 5 gallons. Luv it! This is a great product. I took a keg to a party and used 1 CO2 cartridge to serve the whole keg. No need for messy beer line or heavy CO2 bottles. Buy the faucet and the small CO2 injector! I used this to bring a 5 gallon keg to a family party in December. The weather was cold enough to leave the keg on the porch, and since the keg was already carbed and pressurized, very few shots of CO2 were needed to serve the beer. A must for kegs on the go. I took mine apart and attached a hose in between the ball lock and the injector so I could attach the injector to the outside of a 5 gallon cooler. It uses standard 1/4" flare fittings, so it was easy to get the parts I needed at the local hardware store. I have it hooked up to a 2 1/2 gallon keg, and with people stating the co2 lasts for a full 5 gallon keg I was surprised that mine didn't quite last the whole 2 1/2 gallons. I plugged in a second cartridge, and the keg ran out within a pint. The first cartridge probably would have been enough to get that last pint if I wasn't so eager to watch it flow faster. Be careful on the trigger, it only takes a tiny blast to get enough pressure in the keg. It would be nice to get the version with a regulator, but for the price I can make this unit work just fine. Was worried that i would be running through CO2 cartridges like crazy, but was able to push 5 gallons with just 2 cartridges. If you plan to travel with a keg i would recommend picking one up. I used 2 of these to serve my kegs outside during a party. It was a bit tricky figuring out the order to attach things, but once attached, I found that a single cartridge was just fine to serve the entire keg. Just make sure you are conservative on the initial chargings or you will have a foamy mess on first serve.